The nature of the Siberian cat. 1. The Siberian cat had decent ancestors - wild forest and steppe cats. These are true predators, who knew how to get their food in harsh natural conditions and who knew a lot about hunting. Primordial instincts preserved and a typical "Siberian". And to this day, the representatives of this breed have not lost their skills: they are wonderful hunters, strong, hardy with pronounced leadership qualities. Individualism of representatives of the Siberian breed. 2. Siberian cat in character is akin to a good dog: it recognizes only one owner. Nevertheless, she will never croon before him, and spin under your feet. After a hearty breakfast, the true "Siberian" can leave for the whole day for his cat's business, and maybe even - return only after a day. This is not exactly a domestic pet, in the narrow sense of this expression. He is not an "object of the interior" or an object of universal love. It is, first of all, an individual personality, with a pronounced need for own territory, where the Siberian cat feels himself a master. 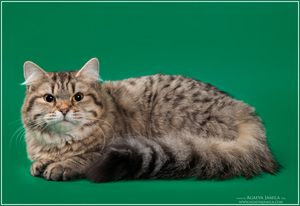 In the photo: a representative of the Siberian breed, cattery "The Tale of Siberia" . True dog devotion, willfulness and accentuated affection for only one person - these are the features of the purebred "Siberian" character. Undoubtedly, this animal is very respects his master. The most optimal scheme of the relationship between the owner and the pet of the Siberian breed is mutual respect. Do not need a "Siberian" too undead and pamper - everything must have a sense of proportion. Where to buy a Siberian kitten. 3. Reference to the acquisition of kittens of Siberian breed. If you are interested in the question: where can I purchase a Siberian kitten with high breed data? Then contact our cattery of Siberian cats, located in the city of Moscow. An experienced felinologist-breeder with 10 years of experience will answer all your questions related to the acquisition, care and maintenance of Siberian kittens. Buy a Siberian kitten from the nursery is a reasonable way to get a pet of Siberian breed, strong health and with excellent pedigree data. Official recognition came to the Siberians in the early 90s of the last century. In the period from 1990 to 2000, the breed standard was recognized by almost all authoritative felinological organizations. The first catteries of Siberian cats were formed around this time. As the popularity of Siberian breeds increased and as a result of continuous breeding work, the number of breeders-felinologists, specializing in the breeding of animals of this breed.